THE PARENTS of a young Spanish boy in danger of losing his hand are making a desperate bid to raise cash for his operation. 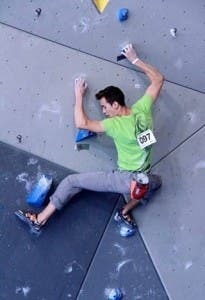 Cristóbal Pineda Rodríguez, 18, is Andalucia’s champion rock climber, but has been struck down with advanced Kienböck’s disease, which destroys the wrists’ bones. The operation cannot be done on Spain’s national health service and the only hospital Cristobal’s Manilva-based family can find to perform the surgery is in Barcelona. The €9,000 cost must be raised by December 29 in order for the operation to go ahead and a campaign to raise the funds by is being backed by the community and all Manilva council’s political parties. Manilva councillor Dean Shelton said: “I’m pleading for the help of the Costa Del Sol foreign community to help us save our local lad’s future. Rock climbing is his job, his hobby and life. Manilva town hall have set up a Facebook campaign page to raise awareness of Cristobal’s plight. Anyone wishing to contribute towards Cristobal’s operation can donate money to this account: Unicaja ES51 2103 0176 03 0010051657.